All hoses we supply have been subjected to a sample BSRIA life cycle test. The hoses can be assembled in any length to customer requirements. The inner core in EPDM with Stainless Steel overbraid (other variations can be supplied) Plated brass end fittings and Stainless Steel ferrules. Both halves are fitted with a poppet type valve which is spring loaded to close the flow path on disconnection. 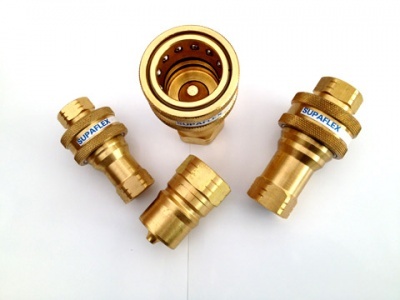 These valves have extended central spindles which meet when the two halves are brought together thus forcing open the valves against their springs and allowing a flow path through the connected coupling. Available In Brass, Steel &amp;amp; Stainless Steel 316 S/S Balls &amp;amp; Springs - Twin Or Single Seals In Buna N.
Other options available including viton for high temperature applications. This photograph shows a 1/2", 3/4" and 1" Dual Shut Off Brass Quick Release Couplings that we supply. They can be used on CHW or LTHW hose connections to Fan Coil Units, Chilled Beams/Ceilings, Radiant Panels and all similar M&E equipment where interchangeability is required and for ease of removal or maintenance by an FM contractor. They have twin 'O' ring seals (not single). They have robust bodies. They therefore DO NOT SUFFER FROM STRESS CRACKING WHEN MATED WITH A BSP TAPER THREAD on the end of the hoses. This can cause, untold troubles post contract for FM contractors, even worse, untold insurance damage with leaking on to building fabric and fittings, resulting in a very irate client/building owner or tenant. 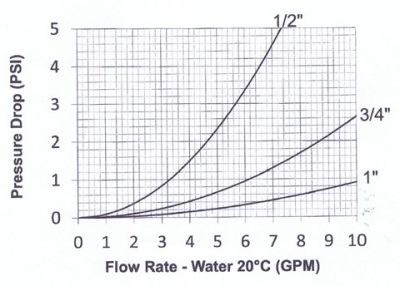 This graph has been produced from tests conducted in the USA (GPM is in imperial GPM not US). To convert to SI units multiply by a conversion factor.